Since Snow White is 74 years old, Aurora from Sleeping Beauty is 52 and Belle from Beauty And The Beast is a decrepit 20 years old, Disney, the font of all things princessy, has created a new princess, just for little girls. Really little: Youngsters between ages 2 and 7 years old. 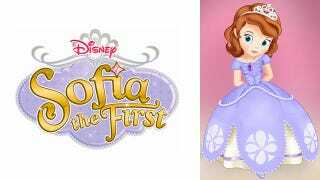 What's different about Princess Sofia — who will star in a TV movie, and series, Sofia the First, on the Disney Channel — is that she is, herself, a little girl. Ariel, Belle, Jasmine and the rest were all young women. Adults. According to the New York Times, Sofia will focus on learning, and things like "the importance of getting along with siblings and how to be a kind and generous person." But! Sofia, is, of course, a marketing gimmick: She will have "plenty of pretty dresses and sparkly shoes," says Nancy Kanter, general manager for Disney Junior Worldwide. All of which little girls will be expecting their parents to buy. Yes, girls love princesses. But they'd also love, for example, a young math-loving character who also enjoys wearing a bedazzled top or two.